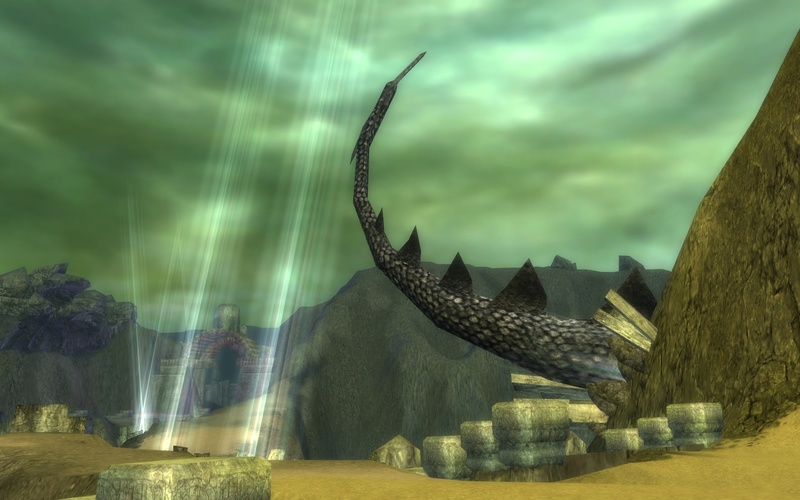 I was very surprised to find out that the Tomb of the Primeval Kings in the Crystal Desert, had been overtaken by an unknown force. This is the site where ancient Elonians buried their kings. 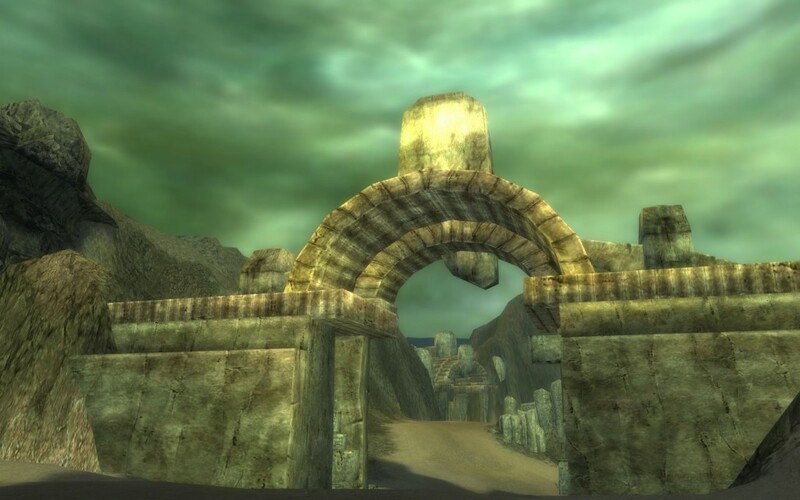 Adventurers came here because of a portal that leads to the Hall of Heroes, where they fought against other adventurers to gain glory and the favor of the gods. 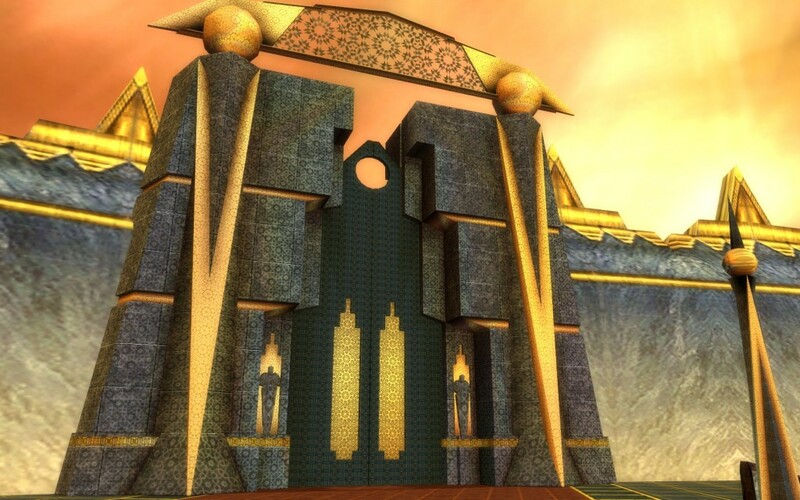 Luckily, even though the portal to the Hall of Heroes at the tombs has been corrupted, the Zaishen Order have found a new portal to the Hall of Heroes. Although I am much more interested in finding out what happened to this area. So I gathered my friends Catfish, Xia, Cver and Zetta to help me explore what has befallen this portion of the Mists. Commander Kuro who was standing by the portal, stopped us on our way in. He pleaded with us to defeat the evil that lies within, but that if we were just foolish adventurers we should head back. Our foes are strong and have a deep hunger for human flesh. If we are to defeat them we must have a plan of action and to keep our eyes sharp. With this warning we gathered around one of the campfires still lit in the outpost and discussed how best to take on our next challenge. At first we were not sure what to plan for, so I decided to retell the story of Lord Ordan while we gave our plan more thought. Long ago, a powerful mage named Lord Ordan managed to uncover a way to gain access to the Mists. 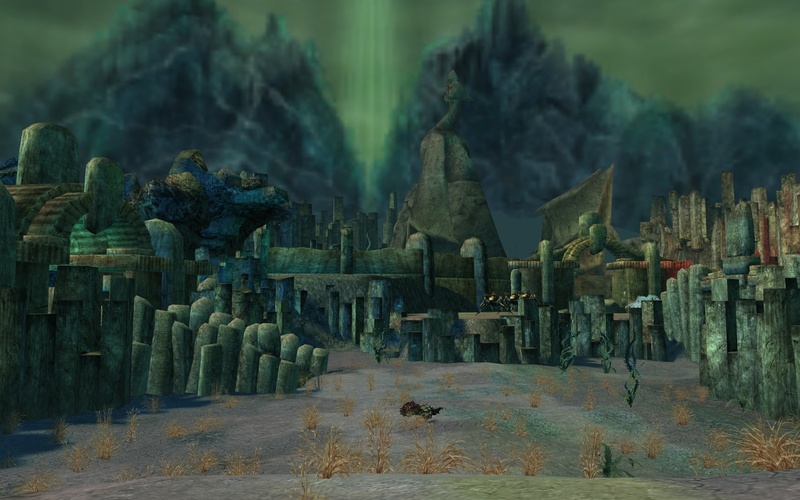 His studies on temporal distortions led him to find a special spot known as the Rift, a place where time stands still and where you must go if you wish to explore the Mists. You can think of it like a gateway. 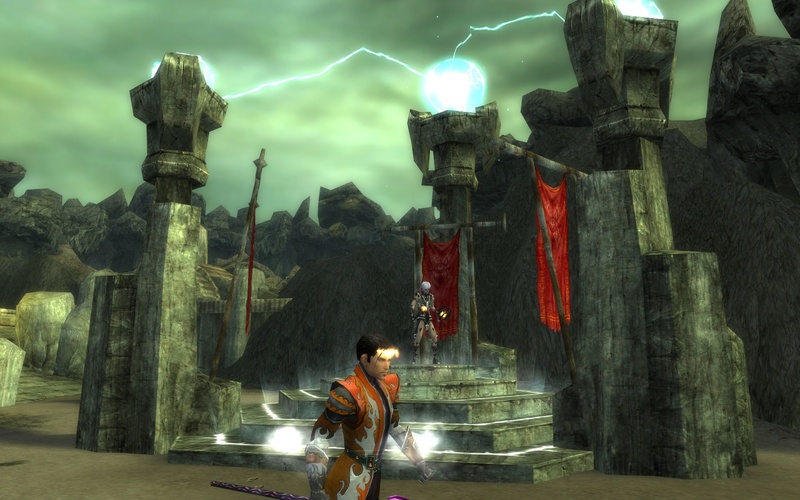 At the center of the Rift, Lord Ordan found a way into the Hall of Heroes. This is where the spirits of champions reside, and until the mage arrived only the undead could go there. It’s not surprising that these spirits were furious with a mortal running around. At first the spirits, who had long been dead were not able to harm their intruder. Over time though, they managed to find new ways to harm the living and killed him. When they thought that all of their troubles were over, the magic he used to hide the portals that lead into the Rift failed. These portals which were placed in very hard to reach places, if found, could be accessed by anyone. 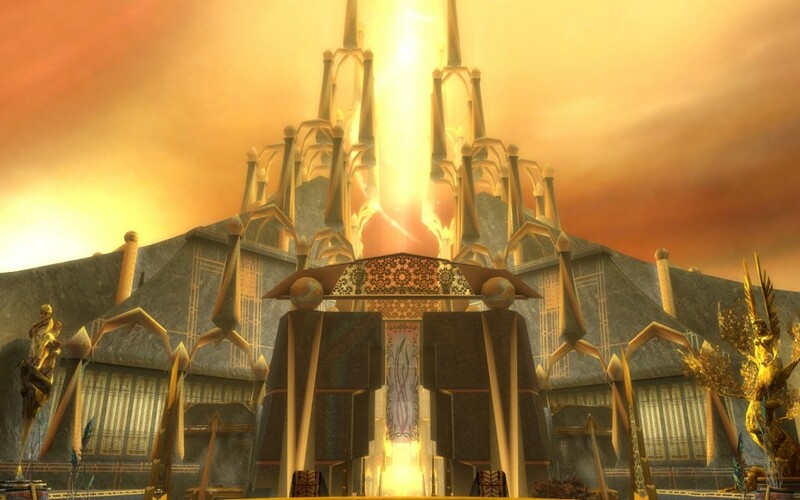 With the increase of heroes seeking to end the evils of Tyria and gain glory, a flood of people have entered the Hall of Heroes as of late. It used to be that ascension was a big deal, but now there is an influx of mighty heroes that can achieve this if they set their mind to it. With what I said, we decided on the final details of our plan and headed into the ominous looking black portal. We arrived in a portion of the Underworld, where great adventurers previously fought to the death in order to become true heroes. With the corruption, we encountered some strange new monsters that now inhabit this battlefield. 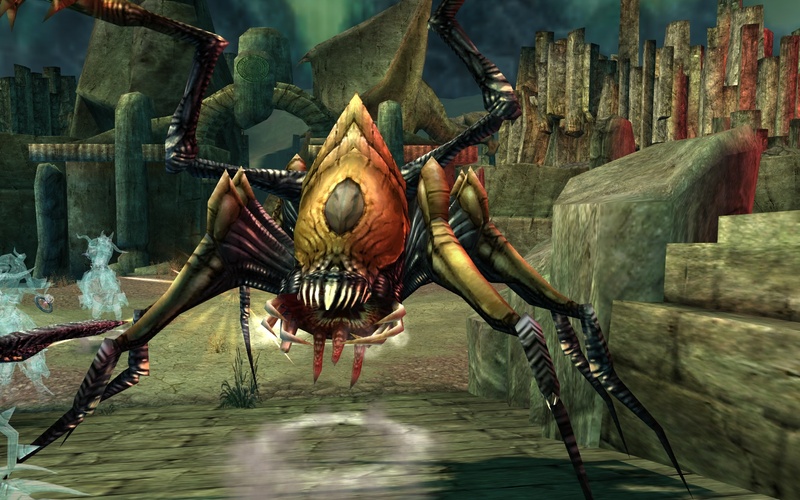 Grasps of Insanity: small creatures with jagged features that somewhat resemble Grasping Gouls from Kryta (in name and movement). Scythe of Chaos: without legs, its body hovers slightly over the ground, it is similar in appearance to the Smoke Phantoms or Wraiths of Kryta, except that it’s tattered rags look twisted. Terrorweb Dryders, Banished Dream Riders and Chained Souls, which are native to the Underworld, also were present in this area. The dryders in particular can be annoying to deal with, but as a ranger I can interrupt them as they concentrate on casting the spell, Meteor Shower on us. 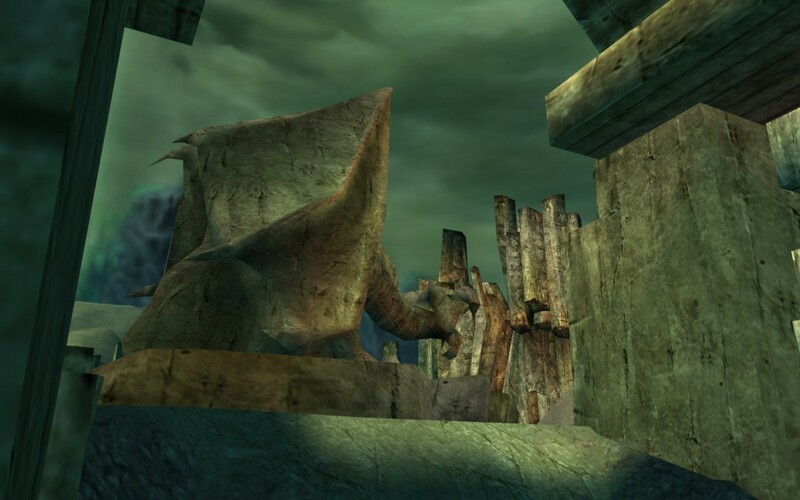 With all the enemies defeated, I took the time to look around quickly and noticed this statue of a griffon behind where I fought the dryders. We were transported to the next level, known as “Scarred Earth”. I am pretty used to being teleported around to get to new places, but it is still a strange experience. Not far into Scarred Earth we found an obelisk which Zetta and Catfish took a liking to. 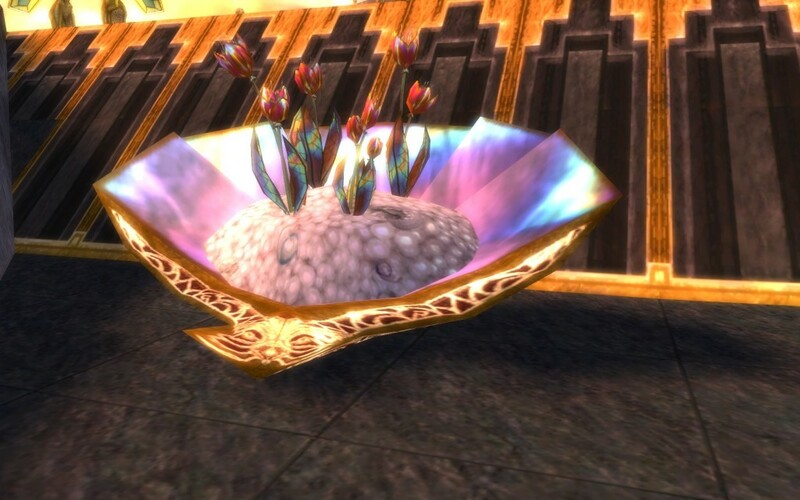 I’ve seen a similar design in Ascalon. 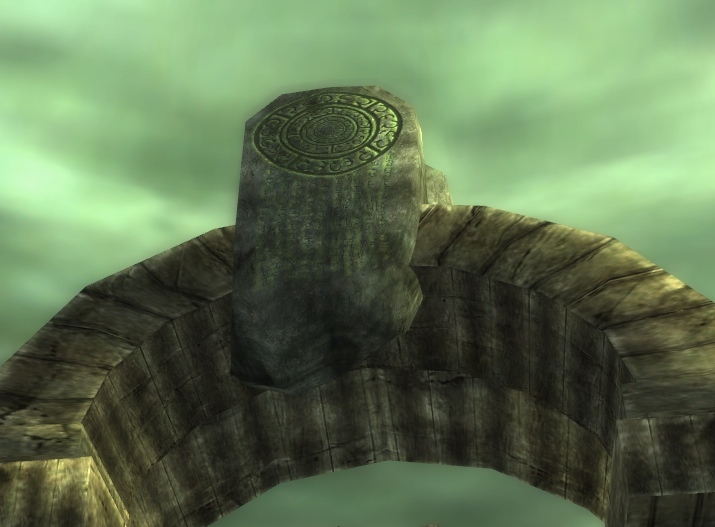 Atop some of the arches, you can find a large circle with runes carved into it and much smaller, less defined runes going down the face of the stone. Given the height of these arches, I couldn’t even begin to try and copy down the carvings. A dragon tail pokes out of this wall. Even though we walked up and touched it, the tail did not move. It looks too detailed to just be a statue, but perhaps I am underestimating the craftsmanship of whoever built this area. Everything looked clear until Catfish approached the platform. 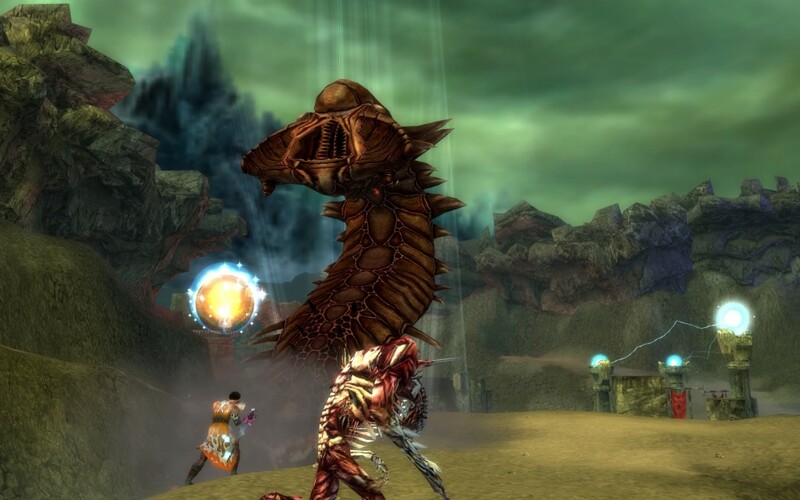 A giant Chaos Wurm erupted from the ground and badly injured him. I offered to go back to town with him, but he insisted that we go on. 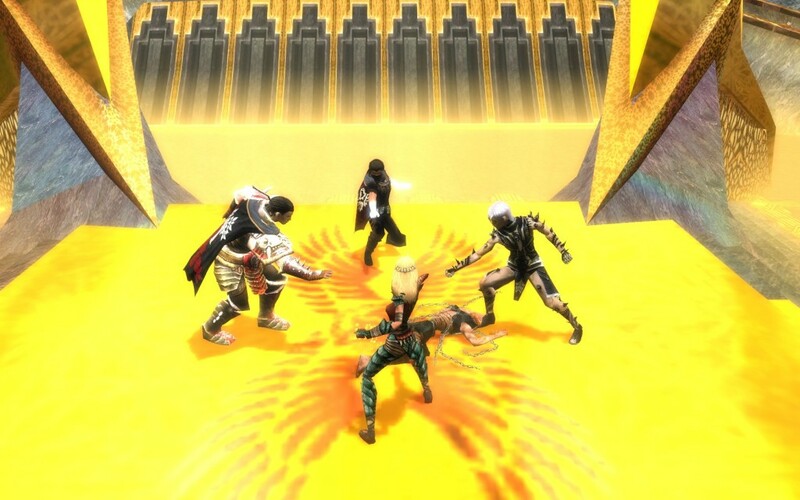 Hopefully between Xia, Cver, Zetta, our hired help and myself we can still reach the Hall of Heroes and defeat the evil that has overtaken it. It was not long before we defeated all of the enemies of the Scarred Earth and were teleported to the Courtyard. 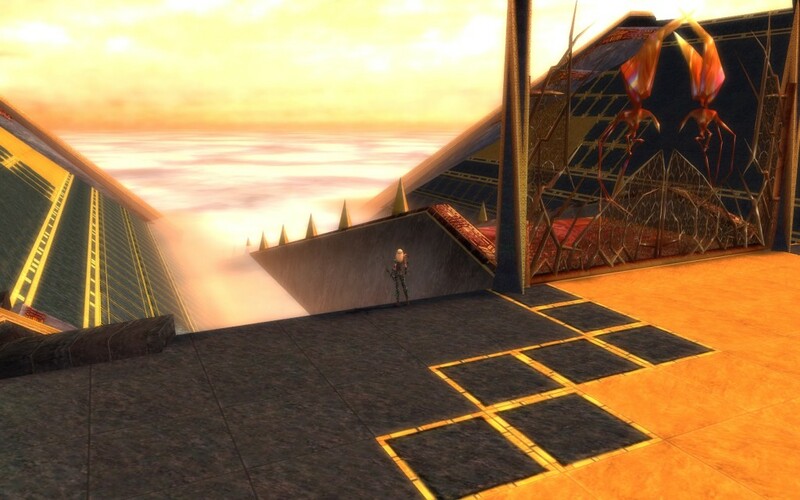 I had never fought my way through to reach the Hall of Heroes before, so I was absolutely blown away by the beauty of this area. We arrived with our backs to an ornate gate. Beyond this gate is just a mess of swirling mist. The experience once again reminded me that we are in a strange land, not meant for the living. Towards the center, a set of winged golden female statues stand in front of a gate. The beauty of this area is amazing, even if we are being assaulted by demonic creatures. The bright sky makes all of the gold shine intensely, including the gold that details these otherwise simple red flags. 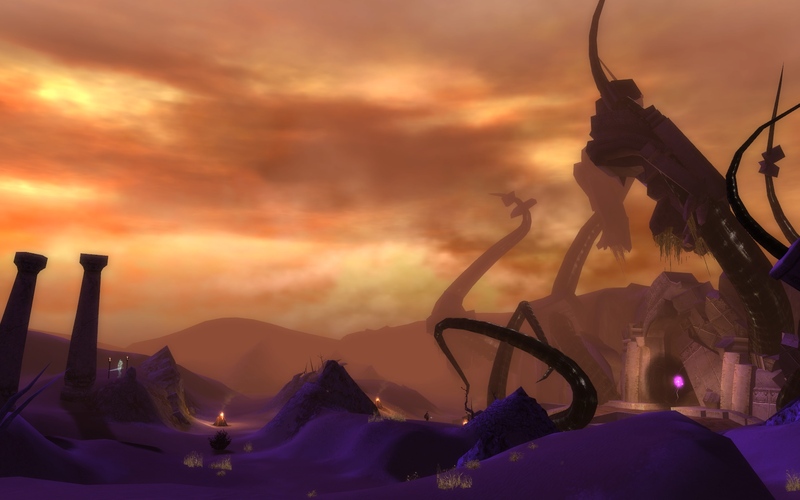 Huge gold creatures that look like dune burrowers really start to make me think about all the work that went in to create this place. 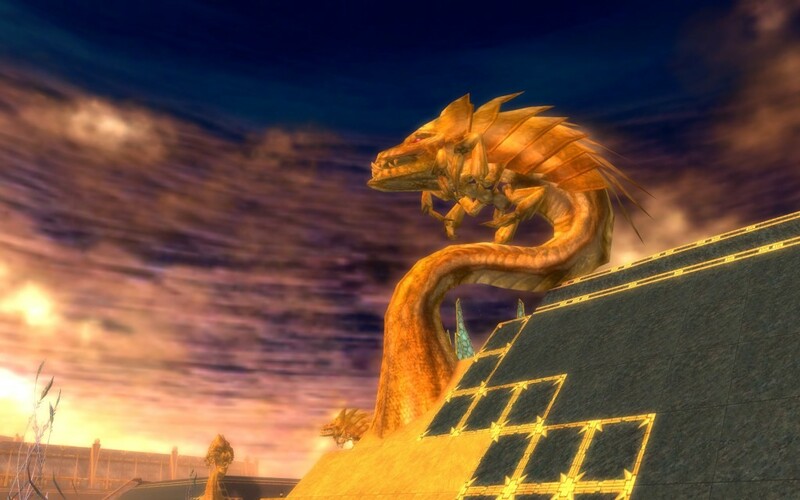 I can’t imagine having enough money in my life time to have so many gold statues and finely crafted structures. Purely speculating here, but did the gods simply snap their fingers to make all of this happen? Giant shells filled with pearls and other ornaments decorate the Courtyard. 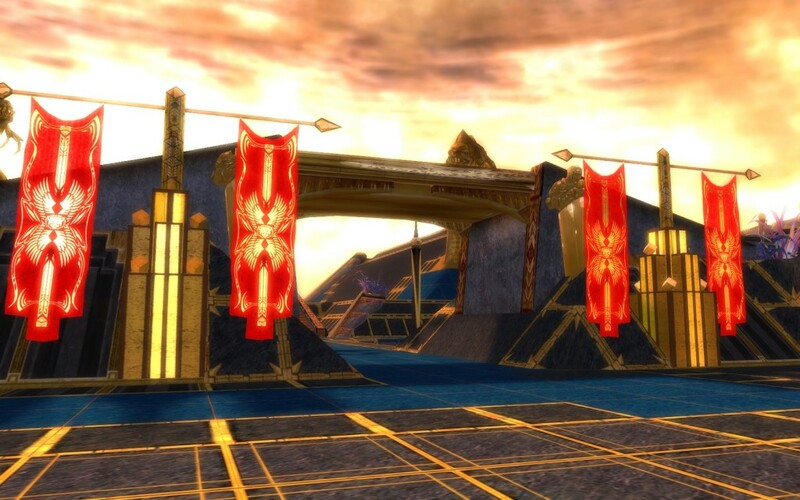 Finally we reached the Hall of Heroes, which is even more grand than the Courtyard. With the first set of enemies defeated, a bridge materialized before our eyes. I stood on the bridge, surveying in front of us. 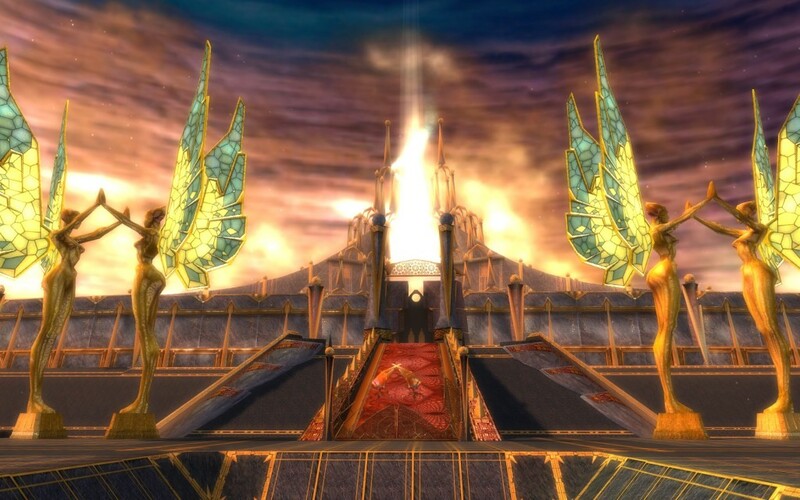 I can see a statue of Lyssa and Melandru in the corner of my eyes, and the most magnificent structure I’ve seen in my life ahead of me. A beam of light dances through the two spires at the top. 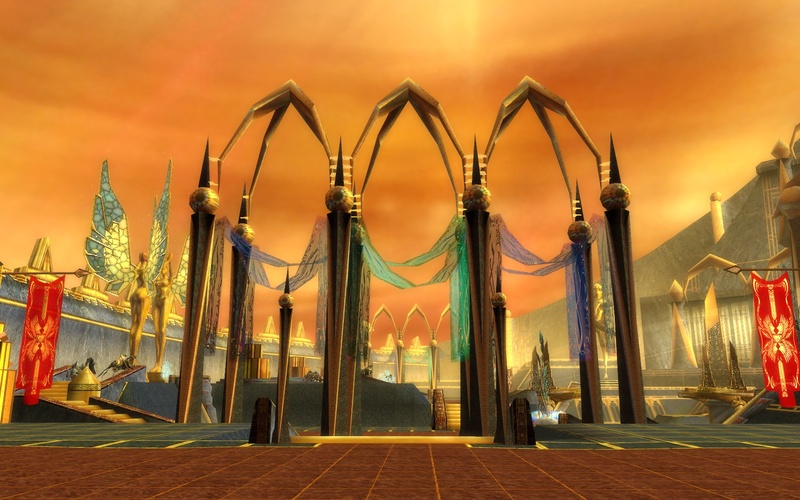 Seeing this helped me understand why so many adventurers want to visit the Hall of Heroes. Not only to gain glory and become a legendary hero, but also to witness something that many people cannot dream of. To celebrate our success so far, I rallied my friends together at the altar. 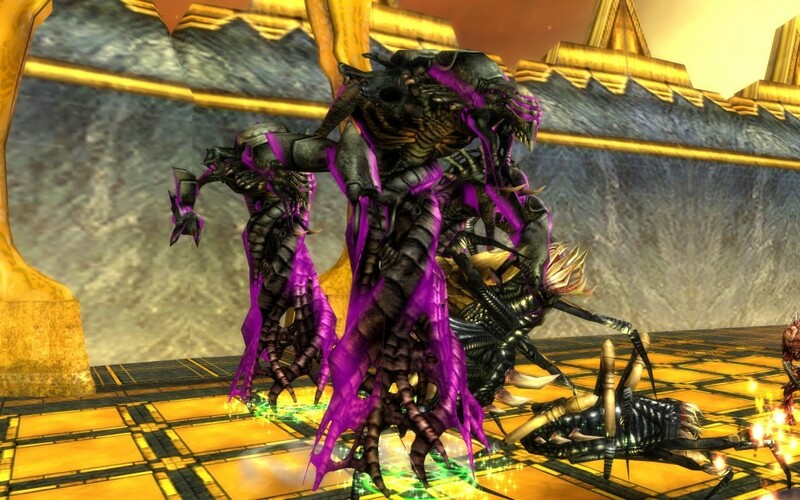 Making our way into the final room, we passed the statue of Grenth and Balthazar before we encountered three greater Scythes of Chaos known as the Darkness. First, we took out the dryders around them and then focused our attention on one of the demonic lords at a time. When the last one fell, spirits appeared before us and congratulated us on our accomplishment. Where the remains of the Darkness lay, we found some old weapons, which we suspected were originally taken from the spirits of champions here. Friends: Xia H.D., Cver D., So Zetta S., Catfish J.